I've installed every version of Ubuntu released in the last four years and enjoyed it getting more and more user-friendly. I was so comfortable with it that I removed windows XP from my father-in-law's laptop and replaced it with Ubuntu about a year ago. I had to spent a couple of hours with him to set him up but that was all to it. He has been using it happily since then.. And I have the piece of mind as I am no longer worried he will be getting malware / viruses on his laptop which is connected to my home network. At the end of April, Ubuntu released 11.04. I upgraded my laptop but left his laptop alone. Ubuntu 11.04 release brought a radical GUI change named Ubuntu-Unity. Personally, I did not find it too difficult to use although it did not seem to me that it made things any easier than they used to be. Today, we upgraded my father-in-law's laptop to Ubuntu 11.04 as well. I let him use it for a while and it's been absolute nightmare for him. He hated the new interface, it was way too confusing for him. One of the reason for the new interface was to simplify the interface and make it easy to find things. Unfortunately, his experience was exact opposite. So, I rolled him back to Classic Ubuntu (Gnome) interface. You can find detailed instructions here to roll back. "The new, highly simplified desktop interface “borrowed consciously” from “other successful platforms,” including Windows and Mac OS X, Shuttleworth said." according to eweek.com. So, I will have him try OS X to see if he is going to have the same challenges. If he can use OS X just fine, then maybe these borrowed ideas were not implemented well enough in Unity. Update [08/01/2011]: He found OS X easier to use than Unity. Simplee is a new service that is worth checking out. 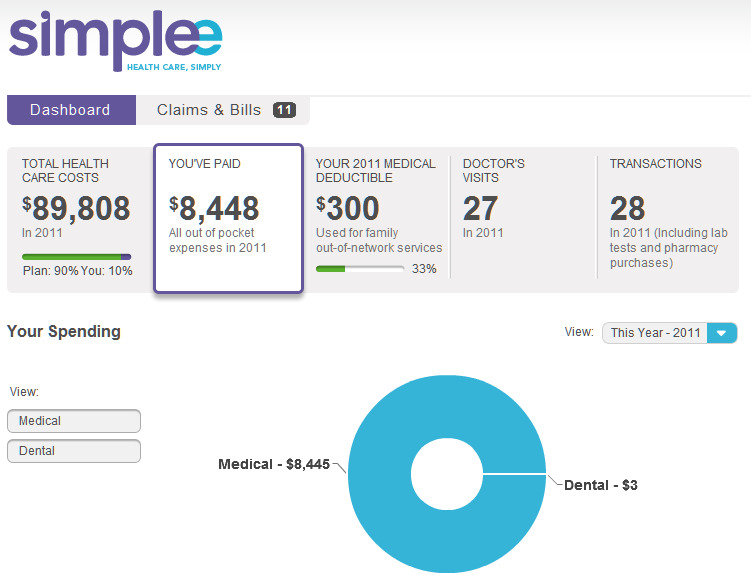 If you are using Mint.com for your finances, you can think of Simplee as the Mint of your healthcare spending. Set up is easy. You have to provide your credentials to log into your healthcare provider's web, and then rest is a well designed page that you can see an overview of your healthcare situation and can drill down as necessary. It was quite astonishing to see how high the charges are and how you are shielded (or not) from such costs. There is some information that I am not able to explain as it claims that I owe some money because of some visits but in reality my healthcare provider covered those. Not sure if it is some kind of mistake or just a misunderstanding on my part. They have a Twitter account where you can post questions as well. Oh, here is the LifeHacker article on it. It's been two years since I posted an entry about Passwords and highlighted an issue where even a highly respected company like Amex would only allow you to create weak passwords. * Your new password cannot have any spaces and will not be case sensitive. 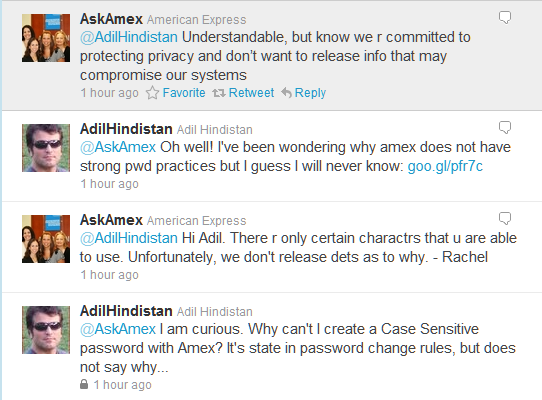 Why on earth Amex would still insist that their customers cannot create CaSe SenSitiVe passwords is beyond me. It's a well known 'good-practice' to mix Upper and Lower case letters in passwords. There is no way security team in Amex does not know about this. So, why not allow it??? I asked them in Twitter to find out. Well, as you can see from exchange below. They won't say why.. While on subject, Steve Gibson has a fun page titled Password Haystack. Worth taking a look.